New and innovative ways to teach RI Latino history | RI Latino Arts • Blog • ¿Qué Pasa? The Latino Oral History Project of RI (Nuestras Raíces) was started in 1991 and is managed by Marta V. Martínez, the Executive Director of the RI Latino Arts. It is a collection of the stories and lives of Rhode Island’s Spanish-speaking pioneers. Marta has been compiling these stories for over twenty-five years and the immigrants she interviewed came from different Latin American countries, many arriving here with little more than a suitcase and hopes for a better life. Their poignant stories engage viewers on different sensory levels. Teachers and youth group organizers can contact Marta if they want her to visit their classroom or program. For more information and to purchase a copy of the book, click here: www.nuestrasraicesri.org. When purchasing a copy of the book through our organization (and not through Amazon), you will be donating to the Juanita Sánchez Community Fund at the Rhode Island Foundation. Café Recuerdos will teach people of all ages, particularly elementary to high school students in Rhode Island’s most underserved communities, about the history of Latin American immigration to Rhode Island through an innovative blend of artistic and educational activities. Programming developed with partners at key community organizations, and implemented by educators, librarians, visual and performing and artists will primarily target people of Latino heritage, but will be accessible and meaningful to non-Latinos as well. Diversified activities will serve a wide audience of young people, and build artistic and literacy skills. Through the study of true stories of Latino immigration, all those engaged by the project and its outreach activities will gain a deeper understanding of history, heritage and community. Our main goal is to illuminate, through a compelling art installation, the diverse stories of Latino immigrants to RI, and to enhance the viewer’s understanding and appreciation of this ongoing part of our state’s cultural history. The venues chosen for exhibition and programming will be the community of South Providence and will offer a culturally relevant arts project that will bring the community together in celebration of their heritage. The visual core of Café Recuerdos will resemble a peddler’s cart, recalling those with which vendors once sold their wares. 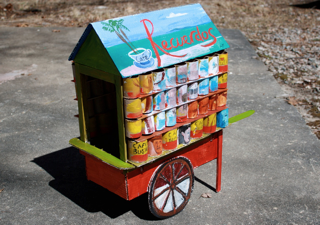 The wooden cart, which has already been developed through sketches and working model (see below) by Charlestown-based artist Ana Flores, will be fitted with “wall supports” made of Café Bustelo coffee cans painted with the likenesses of Latino immigrants to RI. The coffee theme was chosen because of its strong appeal to Latinos, a daily ritual that, far from being a quick pick me up at Starbucks, is connected to unhurried conversation with family and friends; coffee is thus a powerful memory catalyst.